At the Kaplan Center, basketball is usually played in one of the gyms, while aquatic activities take place in the pool. Water basketball, played in the activity pool, blurs these boundaries to create yet another fun activity for UNCG students. Healthful eating seems to take some effort. It’s not always convenient or popular, but definitely worth the effort. Edible Wisdom Online is a Canvas organization that allows you to learn about healthy eating on your own time and at your own pace. Simply self-enroll and select any topic that interests you. Intramural Sports wrapped up its first full league of the 2018-2019 season. Sand Volleyball offered participants a chance to meet new people, make friends and enjoy some friendly competition. On championship night, we crowned 3 new champions. 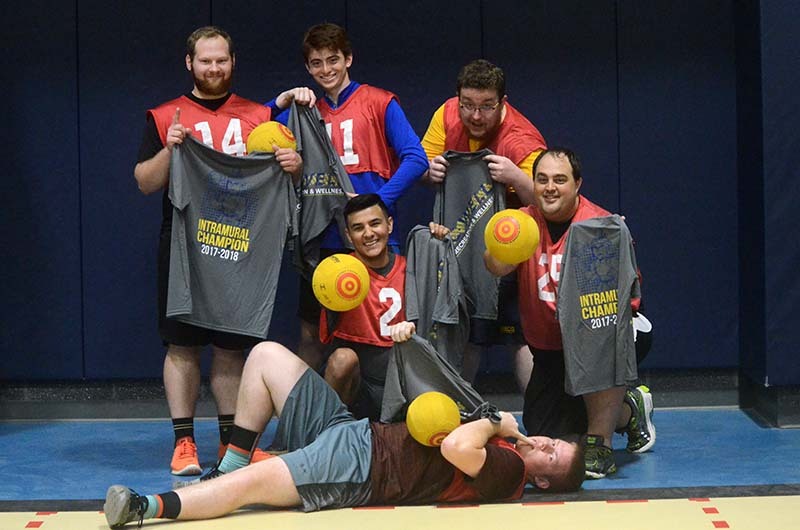 The school year may be winding down, but Intramural Sports dodgeball action was heating up Tuesday night as teams vied for championships in the recreational and competitive divisions. The championships were held in the Kaplan Center’s multi-activity court.